The Folding Bed Blanket - Folds / Raises Blankets. This folding blanket raiser is manufactured from chromium plated tubular steel construction which fold completely flat when not in use. 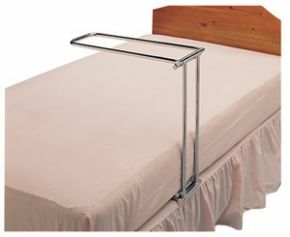 the bed cradle is excellent, i can now get a better night sleep with out the quilt agrovating my legs. it folds down for easy storage and just slides under your matress it couldnt be simpler i would recommend this product for anyone who find the quilt causes pain during the night.